You have 2200 characters. Don’t forget to add important and relevant keywords in your description to improve your iTunes app page and optimize your SEO. Your app's last version was released on December 09, 2015. It is important to regularly update your app. Best practices recommend to update your app every 4 to 6 weeks. This means fixing reported bugs, improving existing features, launching new features etc. Keep an eye on users' feedback. The next great features may already be asked by many users. Mattel and ToyTalk present Thomas & Friends Talk to You, featuring all-new fun adventures on the Island of Sodor. And now, fans can talk to and interact with their favourite #1 Blue Tank Engine and the rest of the Steam Team like never before! 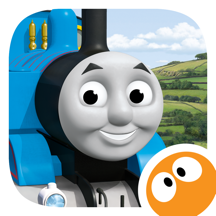 Thomas & Friends Talk to You is intended for kids ages 3-6, but is great for grown-ups and kids to play together. Younger Thomas & Friends fans may need a little nudge to get started. We encourage co-viewing for this experience. Please see the parent's tips page in the app for details. Thomas & Friends Talk to You is certified by the kidSAFE Seal Program. To learn more, go to http://www.kidsafeseal.com/.